Today, I want to talk to you about the world’s hairiest car. No, that should not exist. That should not be a thing we have to talk about. But it exists, and yes, we have to talk about it. In 2014, Italian hair stylist and artist Maria Lucia Mugno of Salerno, Italy drove her 1975 Fiat 500 to a public weigh bridge in Padula Scalo. It was there that she set a world record. 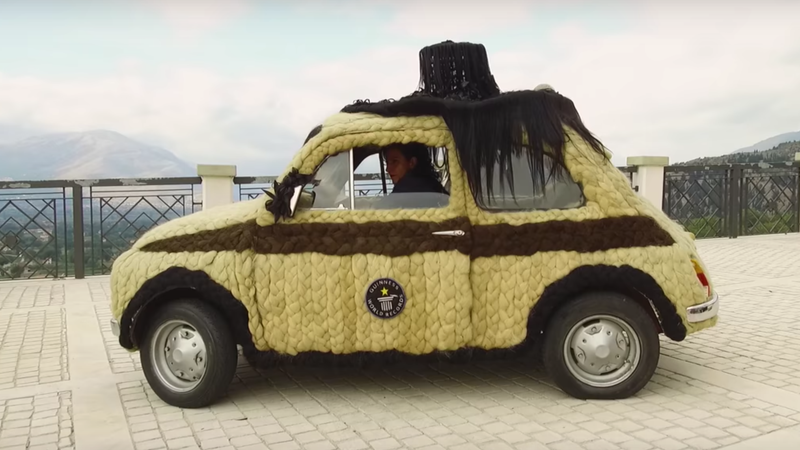 Her car, covered in 264lbs of real womens’ human hair, became the world’s hairiest car. Maria Lucia Mugno spent 150 hours covering a car in hair. Twenty days and over $106,000 covering every single tiny surface of her car in hair. So much hair that it increased the car’s weight by 20%. Hair that she disinfected, washed, bleached, dyed and dried by hand. Hair that she purchased in India. The only part of the car not covered in hair is the engine, but only because that would be a fire hazard and thus wouldn’t be street legal. So, you’ll be sitting on human hair and holding human hair any time you get into the car, and you could definitely take it on a Sunday cruise. According to The Huffington Post, it started as a bet. A friend claimed that Mugno wouldn’t be able to make a car entirely out of hair. So, like any reasonable person, she set out to prove her friend wrong. Her car needs “servicing” once a week. Namely, hair gets dirty, so you have to wash it. So Mugno shampoos, washes, and trims her hair—well, her car’s hair—once a week. “We keep it clean like we would if it was for clients or if it was a real person,” she says. Which makes sense. I applaud her. I, for one, would not have the stomach for it. Mugno mentions that most people are disgusted when they see her car, but even more so when they find out it’s actual human hair and not a kind of yarn or thread. That doesn’t phase Mungo and her family, though; they fully support the endeavor. Interestingly, though, Mungo decided to sell the car on Catawiki. Experts estimated the car at $104,350 - $136,040, but it didn’t quite meet the reserve price, so it wasn’t sold. But there’s a chance it may end up on the market again in the future, so if you have a thing for hairy cars, then you may well be in luck.